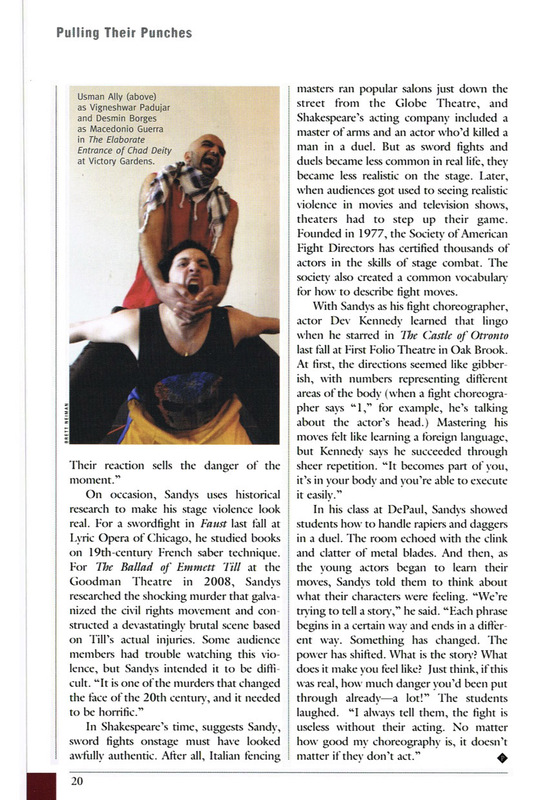 This article by Robert Loerzel originally appeared in Playbill magazine in February 2010. Staging a fight scene for a play is a bit like designing a rollercoaster ride: it should look dangerous, but it needs to be safe. Those swords you see onstage don’t have sharp edges, but they can deliver some serious bruises. Many stage firearms make enough noise to damage someone’s hearing if they’re fired too close to the head. And it isn’t hard to imagine all the things that might go wrong when actors swing their fists, even if they aren’t really trying to land a solid punch. 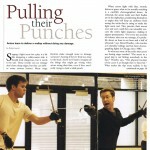 When actors fight with fists, swords, knives or guns, what we’re actually watching is a carefully choreographed dance. In rehearsal, the actors make sure their bodies are in the right place, positioning themselves at angles that will keep the audience from seeing the tricks they’re using to make the fight seem real. They practice their moves over and over, until they can smoothly execute the entire fight sequence, making it appear spontaneous. “For every ten seconds of violence that you see onstage, it’s probably about an hour to an hour and a half of rehearsal,” says David Woolley, who teaches at Columbia College and has been choreographing fights in Chicago since 1982. 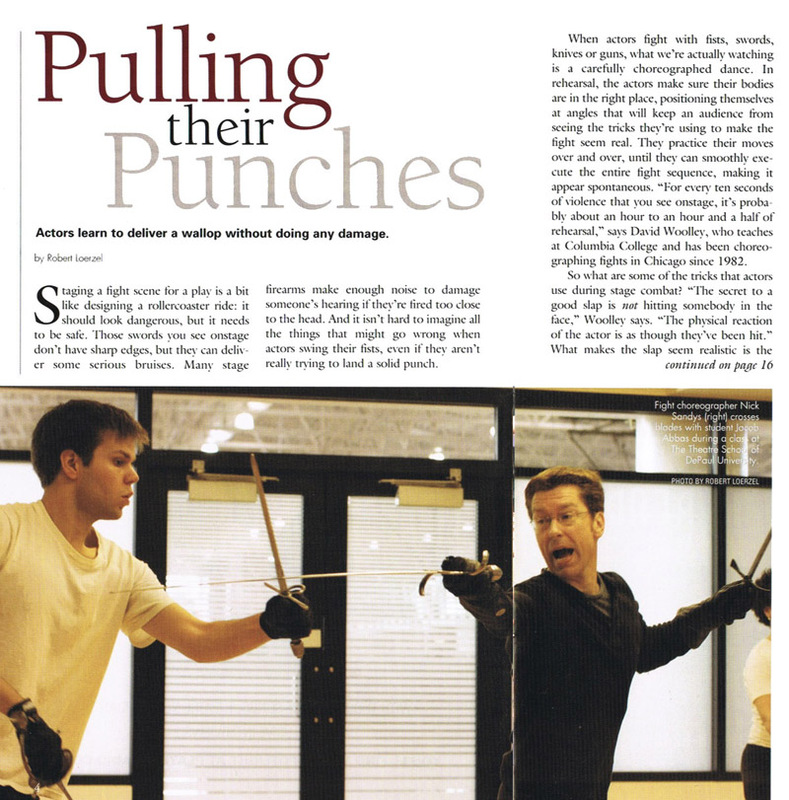 So what are some of the tricks that actors use during stage combat? “The secret to a good slap is not hitting somebody in the face,” Woolley says. “The physical reaction of the actor is as though they’ve been hit.” What makes the slap seem realistic is the sound. Fight choreographers call the sound of people hitting each other a “knap,” and they use different tricks to make a knap. Sometimes, an actor hits his own body with one hand to make the sound, while his other hand seems to be hitting his opponent. When Nick Sandys choreographed a boxing match for Shattered Globe Theatre’s 2008 production of A Requiem for a Heavyweight, the trick was hidden inside the gloves. Sandys says boxing gloves make a hard impact only if the fighters tighten their fists. “If you leave your hands relaxed, they’re like having a big sponge on the back of your hand.” But the sound of the glove’s impact is the same, so the boxing looks and sounds real to the audience. “This looked like the biggest pounding you’ve ever seen in your life,” Sandys says. Sandys, a native of York, England, who’s been acting and choreographing fights on Chicago stages since 1992, revealed another trick of the trade in a class at The Theatre School of DePaul University. He showed his students how to do a “flipper kick.” An actor lies on the floor, with his back to the rest of the class, one hand jutting out like a dolphin’s flipper. Another actor approaches and lift his leg to kick his classmate. To the audience, it looks and sounds like the assailant landed a solid kick on the victim’s head or torso. But he actually just kicked that “flipper” hand, which the audience can’t see. The contact of his foot against that hand made the “knap” sound. In Shakespeare’s time, Sandys suggests, sword fights onstage must have looked authentic. After all, Italian fencing masters ran popular salons just down the street from the Globe Theatre, and Shakespeare’s acting company included a master of arms and an actor who’d killed a man in a duel. But as sword fights and duels became less common in real life, they became less realistic on the stage. Later, when audiences got used to seeing realistic violence in movies and television shows, theaters had to step up their game. Founded in 1977, the Society of American Fight Directors has certified thousands of actors in the skills of stage combat. The society also created a common vocabulary for how to describe fight moves.